Martin and I are huge fans of Anthony Bourdain. His books Kitchen Confidential and Medium Raw speak to my lifestyle as a line cook, while his shows No Reservations and Parts Unknown have enabled us to vicariously explore the food and cultures of far-off places that we could only dream of visiting, all from the comfort of our couch. But when we watched his episode of Parts Unknown: Las Vegas, we knew that an accessible opportunity to follow his advice had finally come. 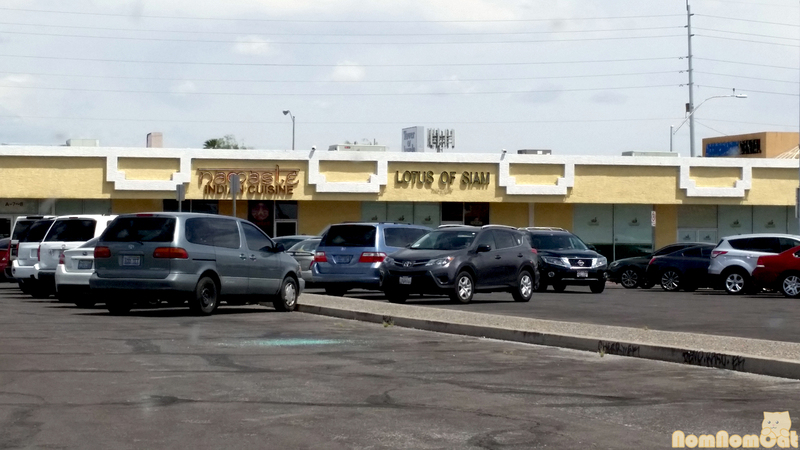 On our most recent trip to Sin City, we went to Lotus of Siam. The single most important piece of advice I can give (and Bourdain has said this himself) is to order from the last four pages of the menu — Northern Thai specialties. 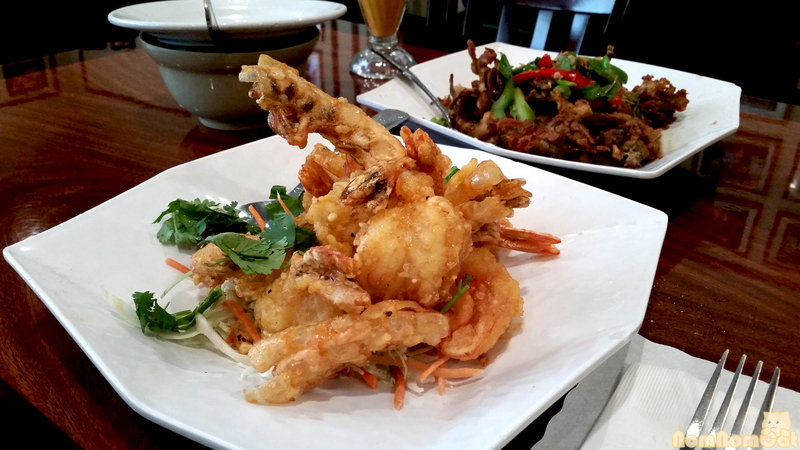 My eyes widened at every menu description and it was hard to pick just a few to try on this visit but we chose the crispy garlic prawns, crispy duck in panang curry, and soft shell crab over drunken noodles. I had to convince Martin to get the three dishes to share between us (I wanted to throw in the khao soi as well but that will have to wait for another time); it was way too much food for just two people but I regret nothing. As I stared sadly at the leftovers that we would be unable to bring with us on the desert drive home, Martin couldn’t help but give me his “I told you so” look. I guess that is my only regret: not having the leftover panang curry sauce over rice the next day for lunch. 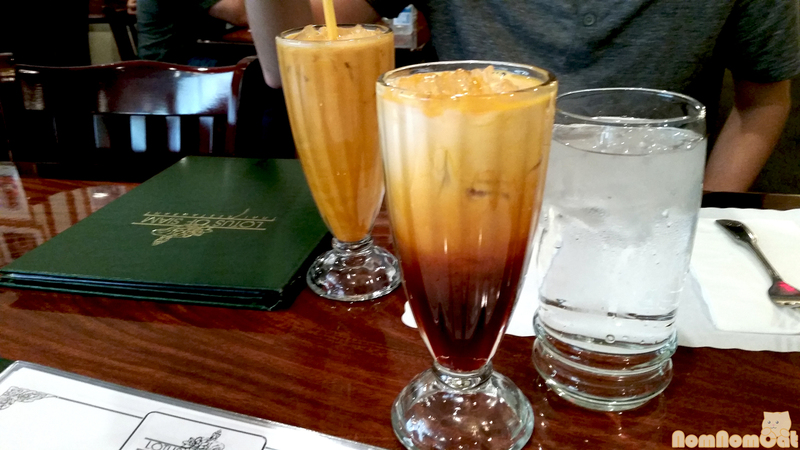 We started with Thai iced tea. The tea mixture, we learned, is pre-sweetened (and quite sweet) so we got ours with extra ice and half-and-half to mellow it out. Still a bit sweet for my taste but I usually consider it to be more of a special treat than a regular beverage anyway. Then the feast arrived at our table like a grand procession. I’m a noodle fiend so one of our dishes just had to feature the flat steamed rice noodles. 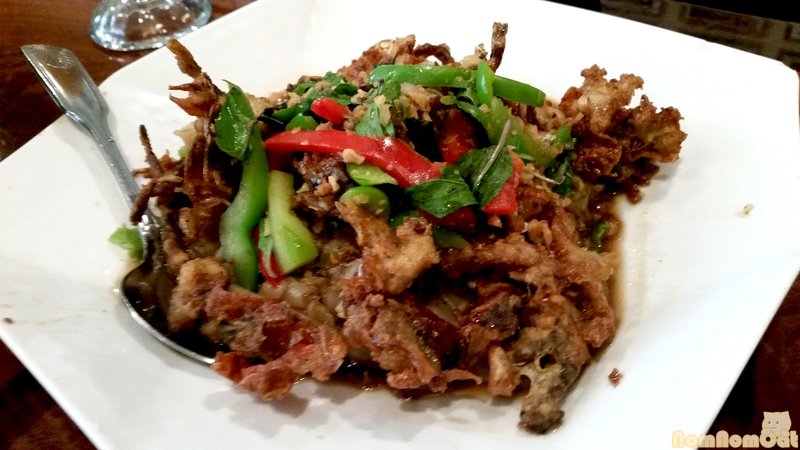 We got the drunken noodles with soft shell crab; the crab was crispy, deep fried, and drenched in the fragrant pad kee mao sauce. Tossed in with the pan-fried noodles were julienned bell pepper and plenty of Thai basil, my favorite! We got the most mild option so Martin could comfortably partake, but I’d love to try this again with a higher spice level. 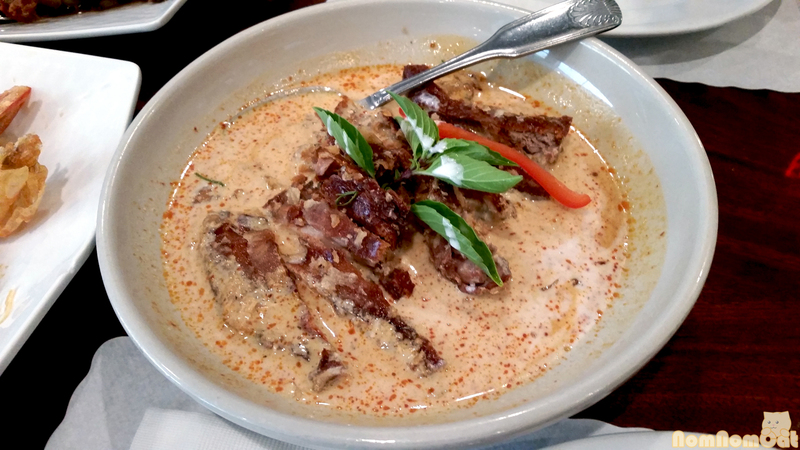 Perhaps the most talked-about dish here is the crispy duck in panang curry — crispy duck gently laid atop a pool of red curry cream sauce bearing a hint of cognac. The duck was incredible — the fat rendered perfectly so that the skin crisped up while the meat remained tender and succulent, almost like a confit. The sauce of coconut milk and red curry was so aromatic that I could eat just that drizzled over plain rice for weeks. Again, we ordered this at the lowest spice level but I will have to try it again with more kick. 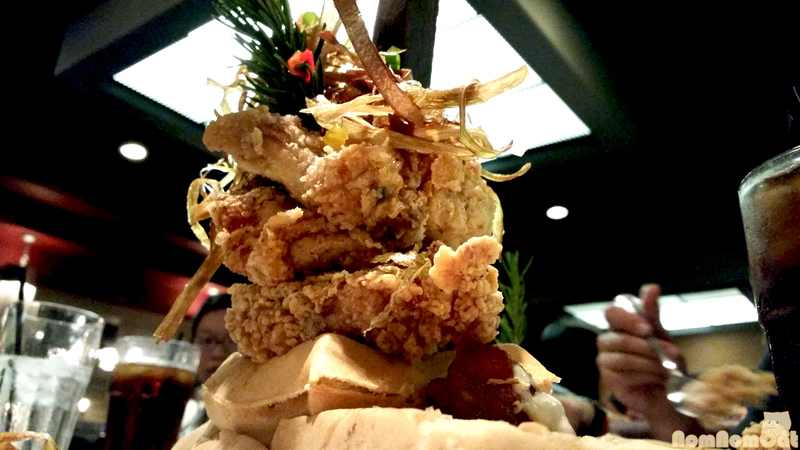 Chef Saipin Chutima was awarded Best Chef: Southwest by the James Beard Foundation in 2011. She is an incredible woman and I am so glad that she was recognized for the amazing food she creates. The next time you find yourself in Sin City, be sure to venture off the Strip for an epicurean experience you won’t soon forget. For us, food is an event that can stand completely on its own. 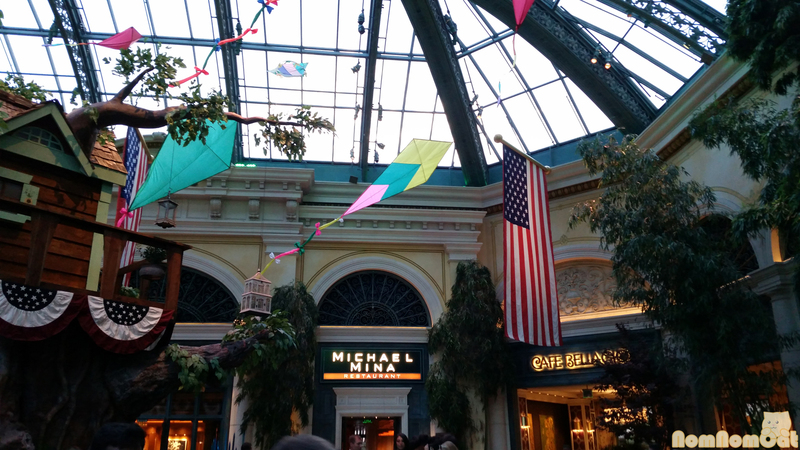 So in retrospect, it was really no surprise that for our four-year dating anniversary, we spontaneously decided to hop in the car and drive through the desert to Sin City for a short weekend getaway capped off with a tasting menu dinner at Michelin-starred Michael Mina at the Bellagio. The service from being greeted by the hostess and GM to our dedicated waiters (plural!) to the ever-attentive bread and water guy was impeccable. The decor was beautiful and the whole experience felt sophisticated but not snooty, a delicate balance for white tablecloth restaurants of this caliber. 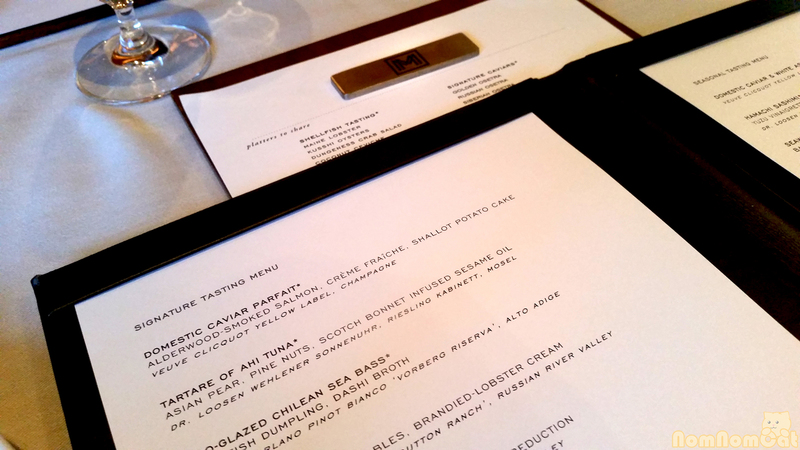 There is a great-looking a la carte menu that includes luxuries like a caviar selection rolled out on a serving cart and a whole lobe of foie gras roasted and carved table-side, but we had our sights set on doing a tasting menu. 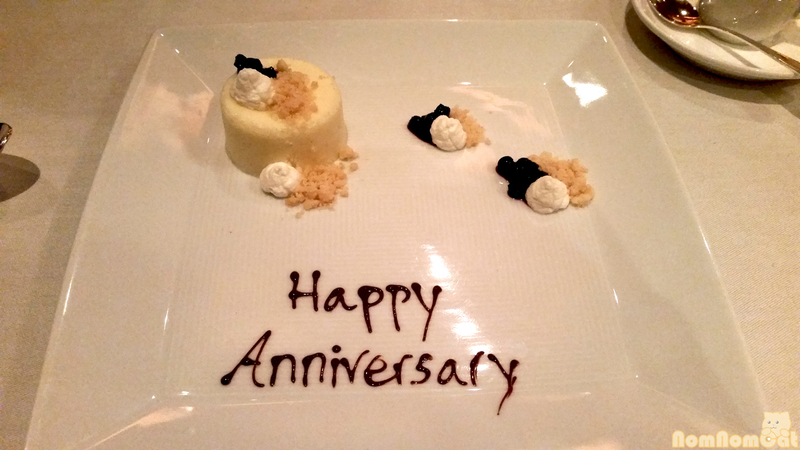 Even then, there were two options – the Signature, which features the six courses of the restaurant’s greatest hits, and the Seasonal, which changes from time to time based on what is available. 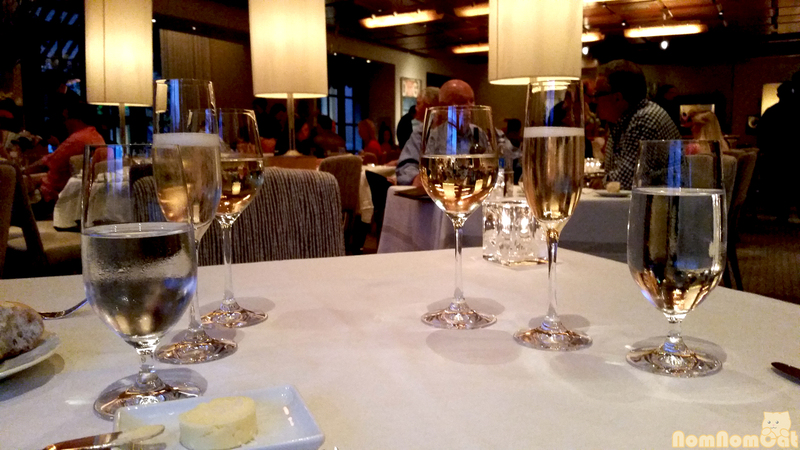 Since it was our first visit, we opted for the Signature which is a steal at $115 per person. We were tempted to do the full wine pairing alongside our tasting menu but decided to each select one of the suggested pairings instead. Just before we received our 2011 Cantina Terlano pinot bianco (Martin’s) and 2012 Dr. L riesling (one of my favorites), we were surprised with champagne to toast our anniversary! Bubbly in hand, let’s get started. 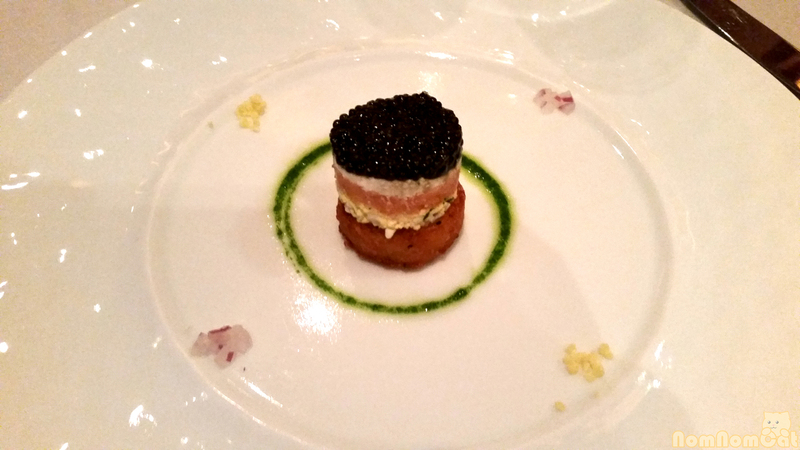 Course 1: Domestic Caviar Parfait – alderwood smoked salmon, creme fraiche, shallot potato cake. A beautiful tower consisting of layered crispy fried potato, cool and creamy creme fraiche, smoky cured salmon, and a generous dollop of domestic black caviar, this dish was an innovative presentation of a classic flavor combination. I also couldn’t help but appreciate the simple yet elegant little piles of brunoise shallot that garnished the plate. Photo-takers beware, this dish is finished table-side. Our waiter was observant, however, and paused so I could take my before and after photos. So kind! 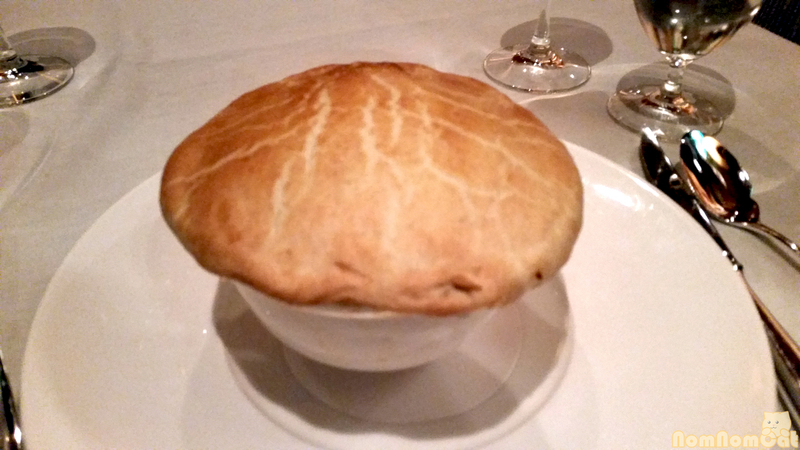 We felt it was a sizable portion to be part of a tasting menu; we later saw another table order the a la carte version and ours seemed to be about two-thirds the size! 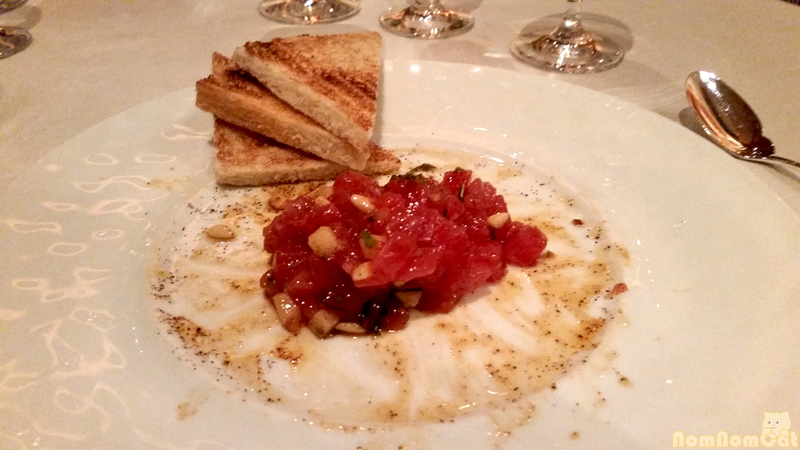 The Asian-inspired flavors were delicious and more reminiscent of a Hawaiian poke than a tartare. Possibly the best preparation of Patagonian toothfish I have eaten! 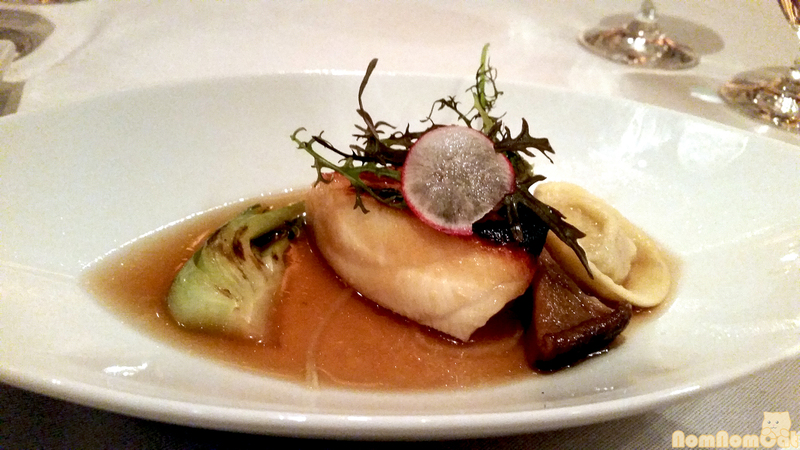 The buttery fish was perfectly cooked and unbelievably succulent. The dumpling looked handmade though it was unremarkable compared to the delicate yet flavorful broth. The garnish of mustard frill and shaved radish gave a welcomed freshness to the earthy miso and shiitake. 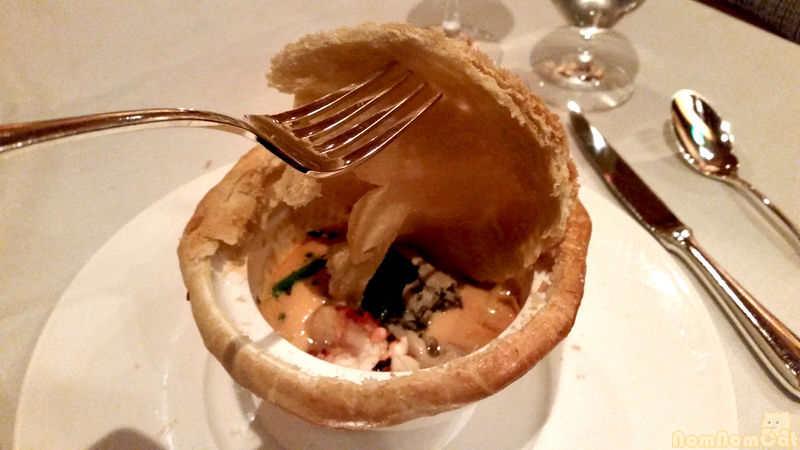 This course was hands-down the most filling and I know when winter comes, I’ll be craving its rich and creamy lobster-brandy sauce bathing fingerling potatoes, lobster knuckles, and other hidden treasures beneath a golden and flaky pastry crust. This too was finished table-side as the waiters carved the crust cleanly, making it easier to lift the “lid” and peek at the filling below. My heart started to hurt from the obscene quantity of butter but it was so, so worth all of the rave reviews. Perhaps the most exciting part of leaving California is being able to consume the contraband decadence that is foie gras. 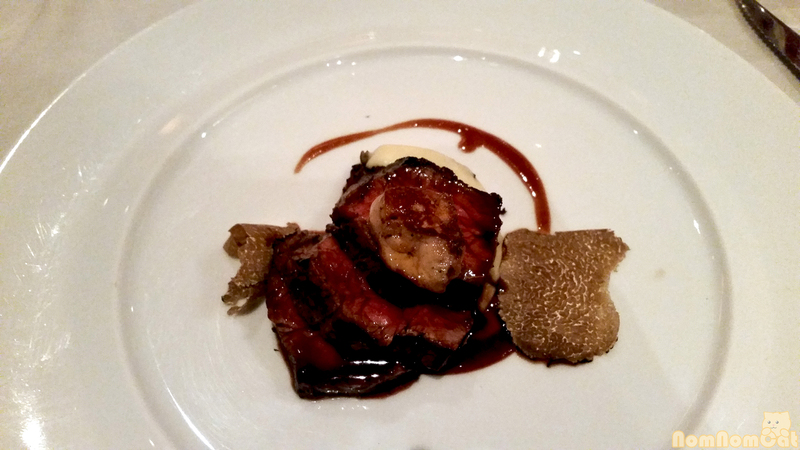 Though we were warned that this particular morsel would be quite small, we were pleasantly surprised to find that the gorgeous slices of seared rib-eye were garnished with shavings of black summer truffle a la Tournedos Rossini. I don’t recall their asking how we wanted the steak prepared, but when it arrived, we saw that it was perfect — bright red medium-rare/rare with an even, crunchy sear. An excellent dish! In addition to the champagne to start the meal, we were surprised with an extra dessert course, complete with chocolate writing that announced “Happy Anniversary!” The cheesecake was airy and light, just the way I like it, and I enjoyed the huckleberry compote to add a sweet and fruity element. 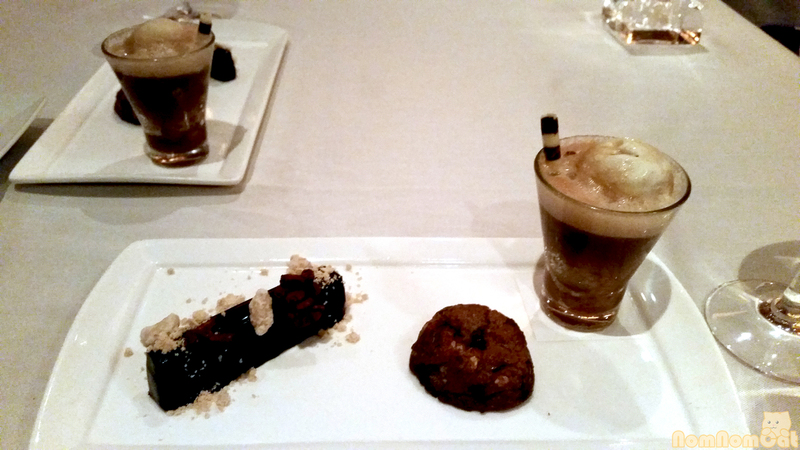 This course was actually a trio featuring the “candy bar” (an elevated Snickers of sorts), a warm chocolate chip cookie, and a root beer float. The candy bar was sinfully good and I could take or leave the cookie, but what stole the show was the float! I first sipped it through the chocolate “straw” before digging in with a spoon. I only wish I had more room in my stomach to polish off every bite! We had high expectations from reading online reviews, perusing the menu, and of course, having specifically selected Michael Mina for its one Michelin star rating. Though the tasting menu and service were both impressive, I was most amazed that the quiet, calm, open kitchen delivered such consistent and beautiful dishes. (I work in a mostly-closed kitchen and it can be sheer chaos back there!) Though there are so many high-end dining options in Las Vegas, I definitely recommend trying the Signature menu here if you get the chance! While wandering the Strip, one can’t help but notice the towering Tour Eiffel, a 1:2 scale replica of the iconic Parisian monument. 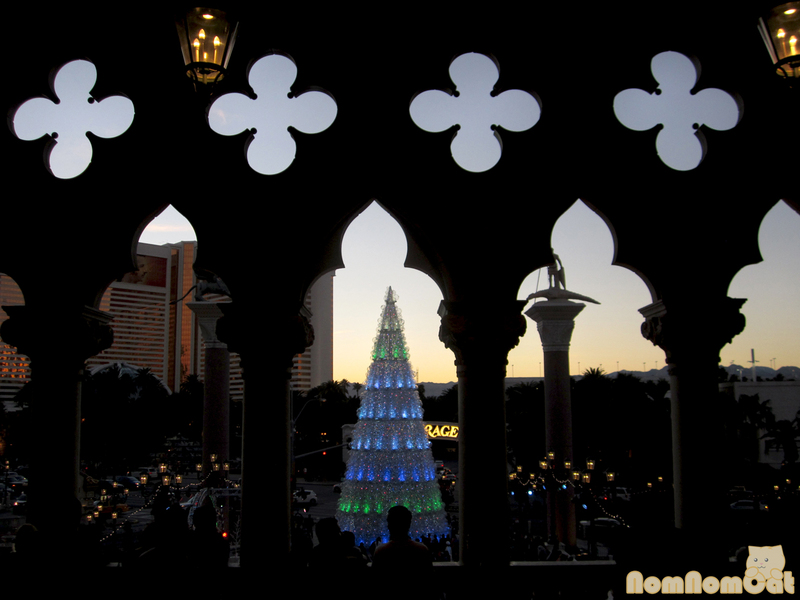 And ever-bustling with throngs of diners, there’s that one restaurant situated right in the front of the hotel, with an excellent view of the fountain show at the Bellagio across the street. 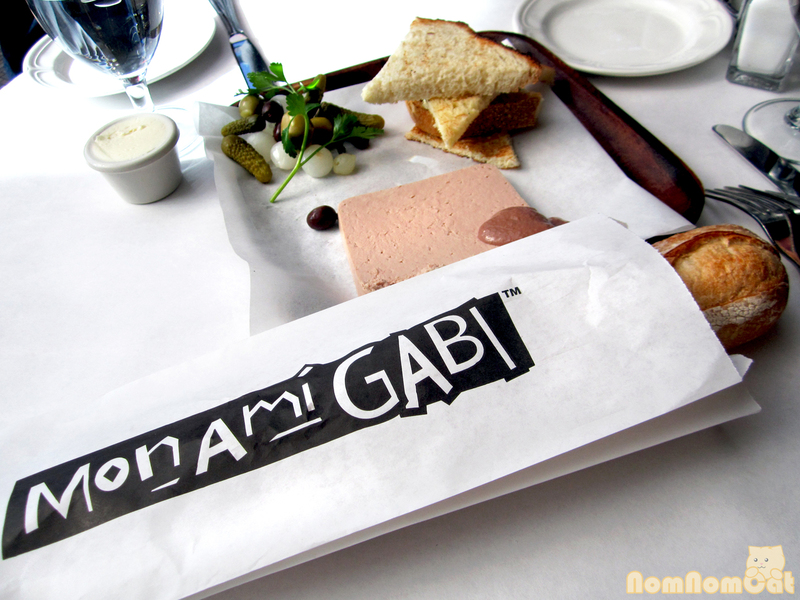 That one restaurant, one we’ve walked past and thought “We should go there someday” many a time, is Mon Ami Gabi. Self-described simply as a classic French bistro, Mon Ami Gabi turned out to be an excellent brunch spot that’s totally worth the hype (though perhaps, not the consistently long wait for patio seating). What’s a classic French bistro without a fresh baked baguette? We were open to seating options so we were seated right away. (I overheard that a patio table would be at least a 30 minute wait, and it was not a particularly busy day in Vegas!) We lucked into a table in the enclosed sunroom; with the chilly weather outside that day, I think we got a great spot! Be warned – the main indoor dining room did seem a bit dark for daytime dining, though I’m sure it would be romantic for dinner or supper. 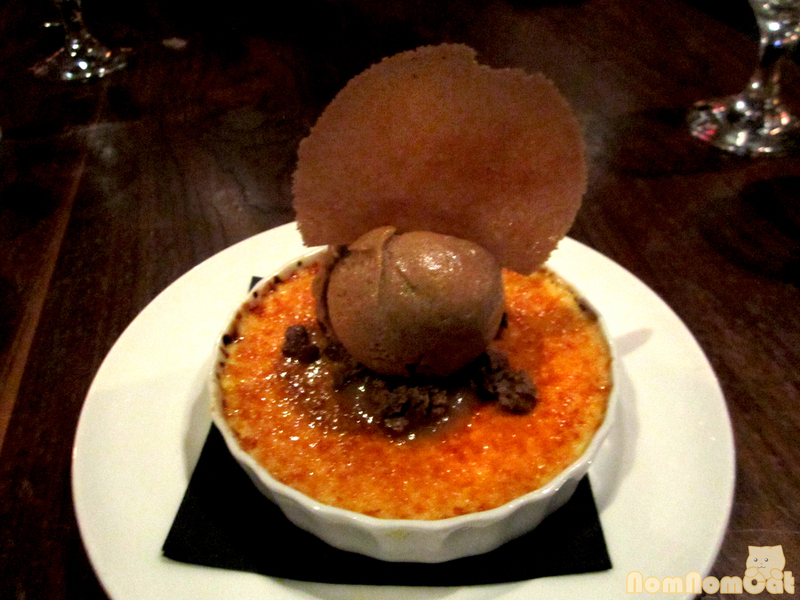 We wanted to try so many of the tempting dishes on the menu but restrained ourselves to a few selections to share. 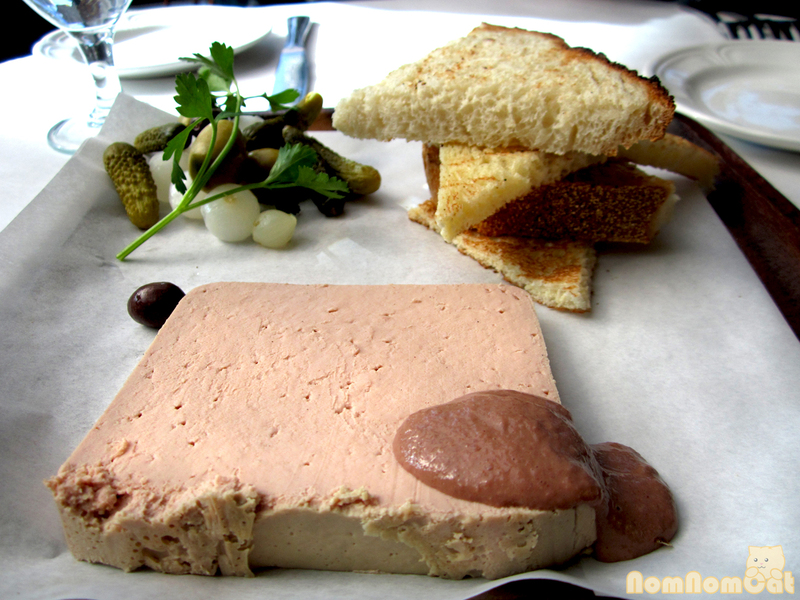 First, the chicken liver mousse. 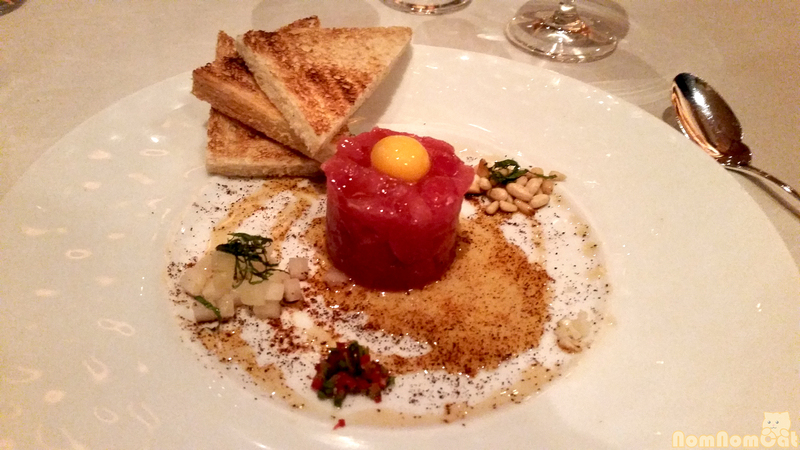 We Californians miss our foie, so we were excited to indulge in its rich decadence. The burgundy red wine mustard added a great acidic punch to cut through the fat, though the buttery brioche would have none of that! 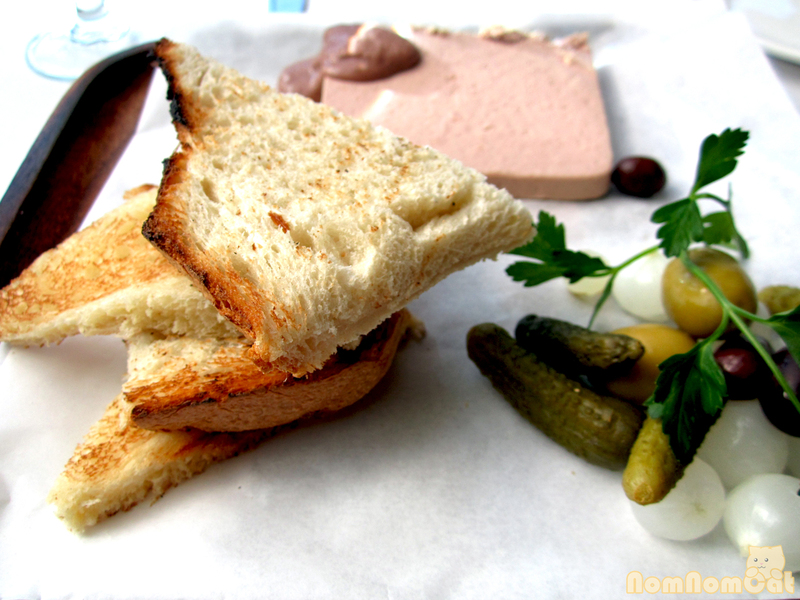 The pate was firm yet spread easily over the toast… La belle vie! We love charcuterie and found this to be a wonderful way to start our morning! A well-timed respite from the fattiness of our first starter, a half-dozen of the day’s shucked oysters arrived just as we popped the last bites of brioche into our mouths. 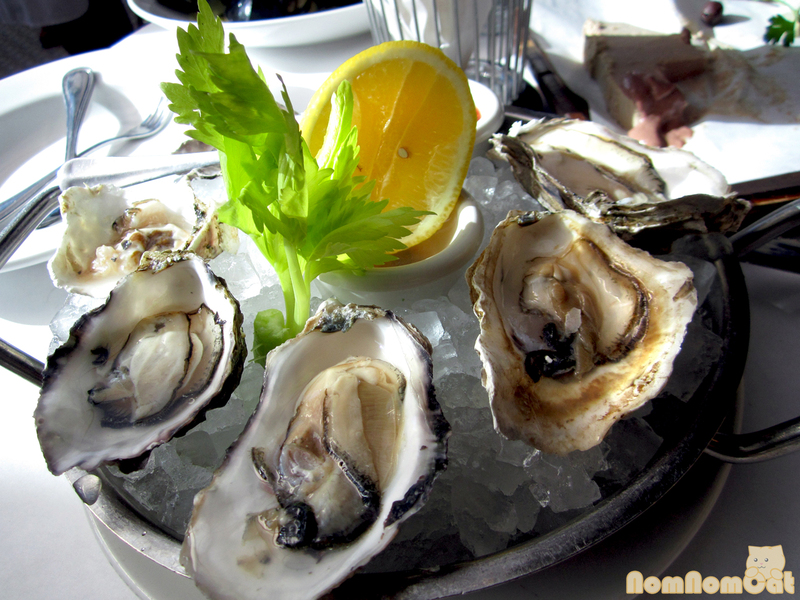 I forgot to ask where the oysters were from, but they were a great balance of sweet and briny… not particularly special but certainly fresh and enjoyable. 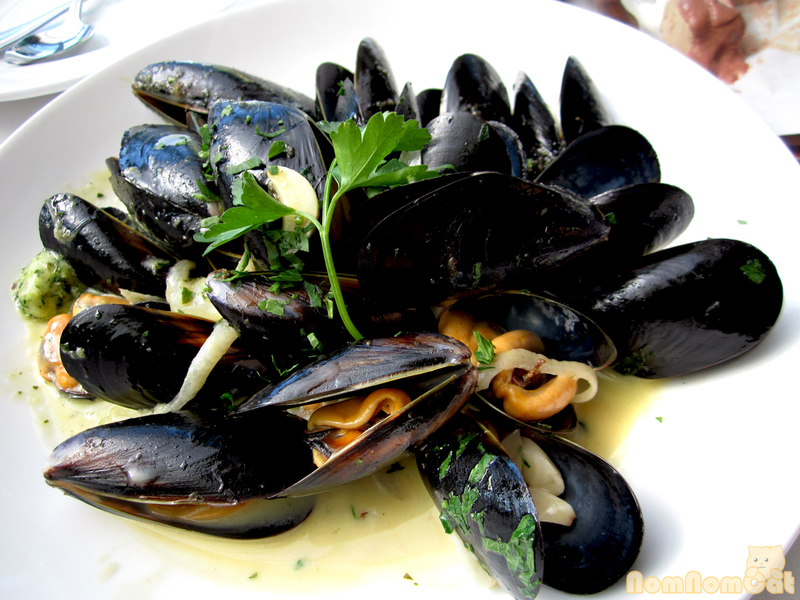 Martin and I have been on a mussel kick lately. After exploring the vast selection at Meet in Paris and making our own marinere style at home, we still could not turn down the opportunity for more. 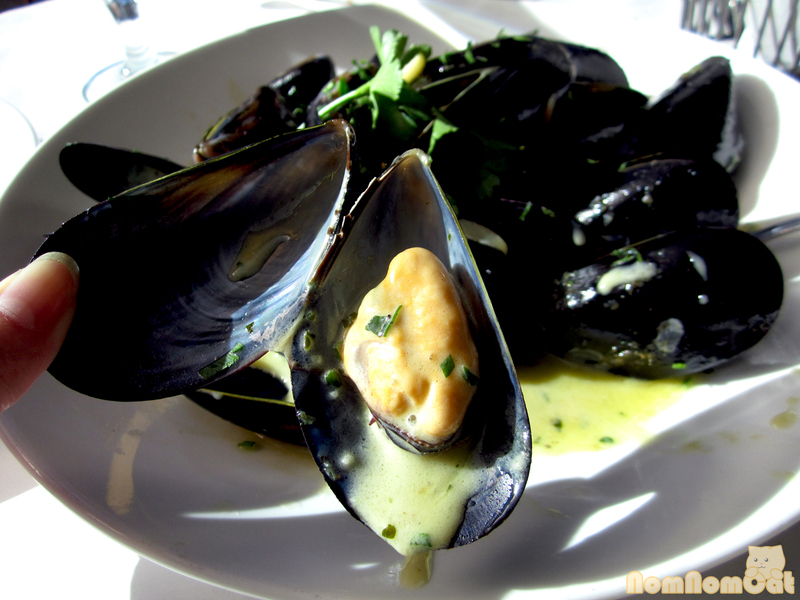 These mussels were quite sizable and, though the menu description listed white wine and herbs, were drenched in a good amount of butter. But if you ask me, it’s not French without butter! 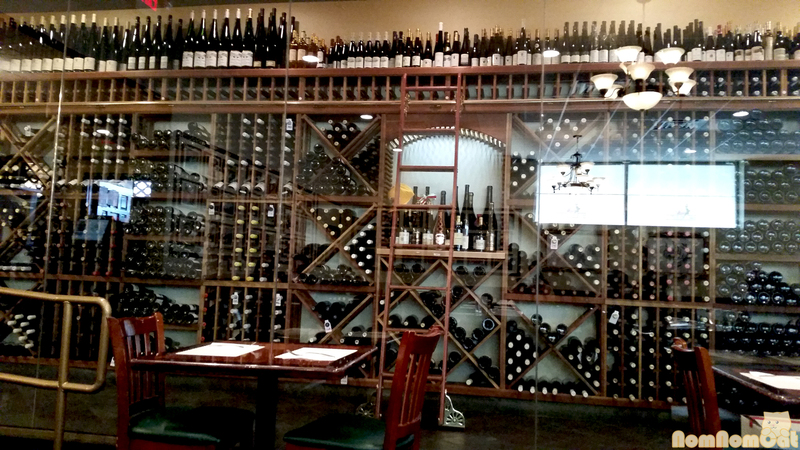 Seafood, butter, wine… it’s the good life. So this may not necessarily be hangover food quite like Earl of Sandwich, but if you’re looking for a brunch hot spot with satisfying food, an excellent view, and a taste of the leisurely French lifestyle, come sample the offerings of Chef Terry Lynch at Mon Ami Gabi. The menu looked impressive and we’ve only just begun to scratch the surface (escargots, duck confit, and tartines also caught my eye). Á votre santé! 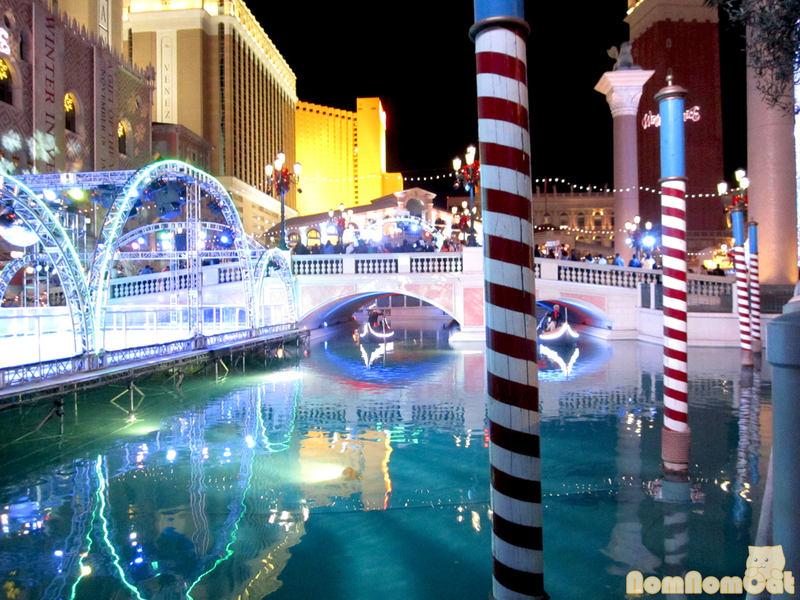 “Who spends Christmas in Vegas anyway?” many of our friends exclaimed. Well, when you’re spontaneous like Martin and I are, and an offer for three free nights of hotel lodging pops up in our inbox, you can bet we will welcome the opportunity for a short getaway to Sin City. Las Vegas has really established itself as a food destination, with many of the world’s renowned chefs opening up restaurants on the Strip. But we decided to save the Robuchons and the Gordon Ramsays for another time. Instead, we had our Christmas dinner at an underrated gastropub (our favorite kind of joint) with Executive Chef Anthony Meidenbauer at the helm — Public House. 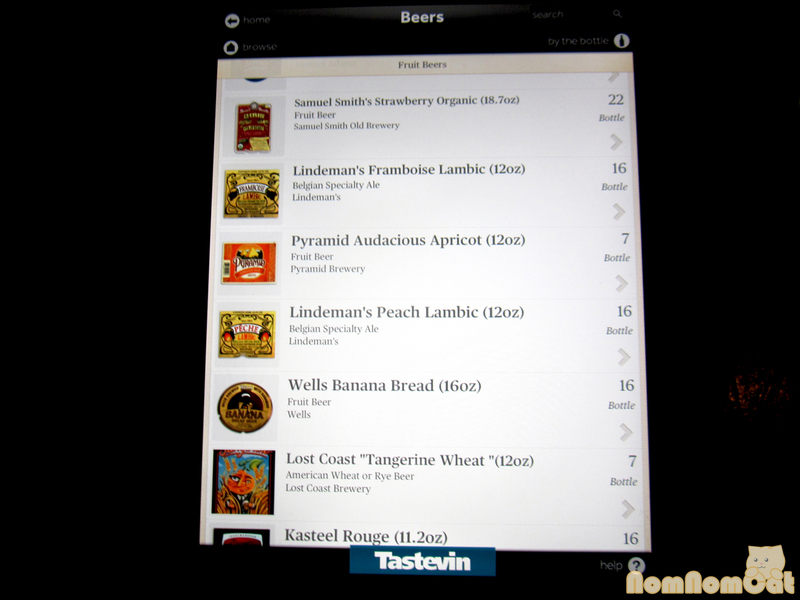 The entire menu looked awesome and suited to our taste, so we had a difficult time choosing just a few dishes. 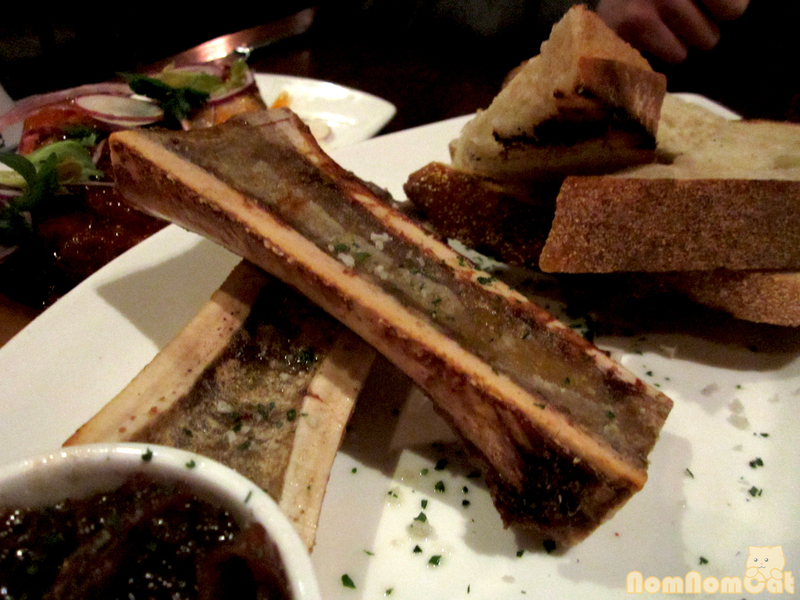 I had, however, been eyeing the roasted bone marrow appetizer since we first decided to make our reservation here, so that was a definite starter. The bones, still piping hot from having been roasted to order in a (probably) 400 degree oven, smelled incredible. The mere sight of this appetizer made me salivate. 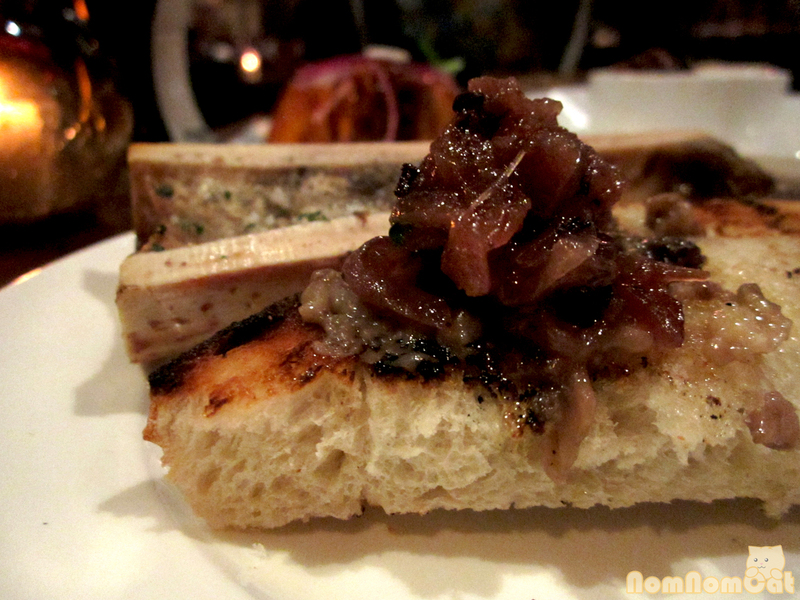 It is admittedly hard to mess up roasting bone marrow (we even did it ourselves at home), and the bones at Public House were made extra special by resting alongside thick, grilled slices of a rustic bread and a heaping pile of bacon marmalade. Bacon. Marmalade. Reminiscent of the onion compote I made for our copycat Father’s Office burgers, it tasted delicious although the flavor was a bit overpowering for the delicate marrow decadence. The marrow itself melted like nature’s butter, smearing effortlessly over the charred bread. Sinking our teeth into that was like a bite of heaven. A great way to start our evening. 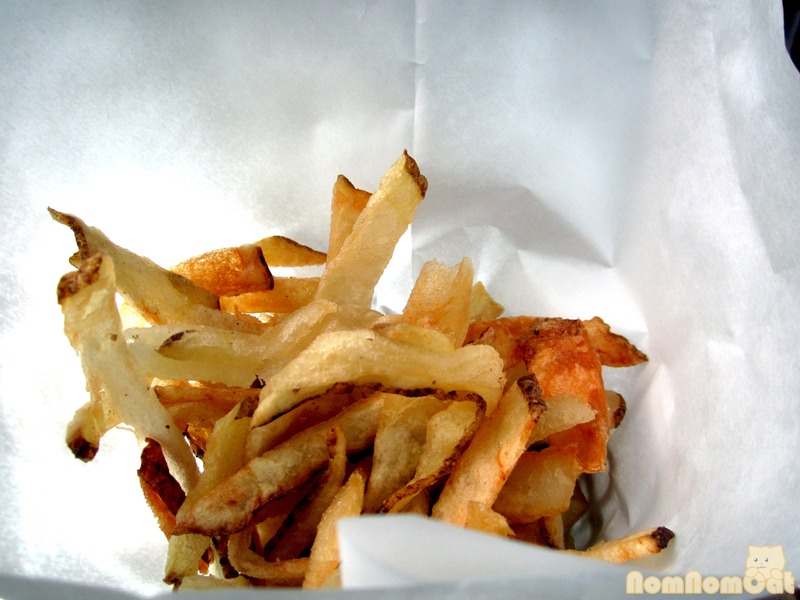 We also ordered a second appetizer to maximize our exposure to the menu’s offerings. Torn between the grilled octopus and the crispy pig tails, we decided to go with the land critter. 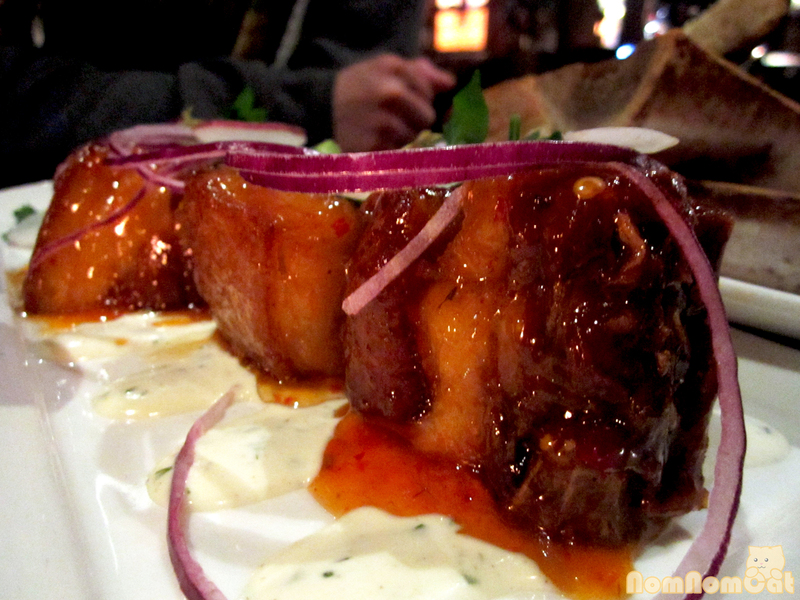 I was a bit surprised to find that the “tail” was really more like hunks of pork belly lacquered in a sweet & sour glaze. Definitely not the curly bits of offal I had in mind. The flavors were interestingly Asian-inspired, but as the fatty layers were still quite heavy and not fully rendered, this was not my favorite dish of the night. Martin and I were both in a carnivorous mood. 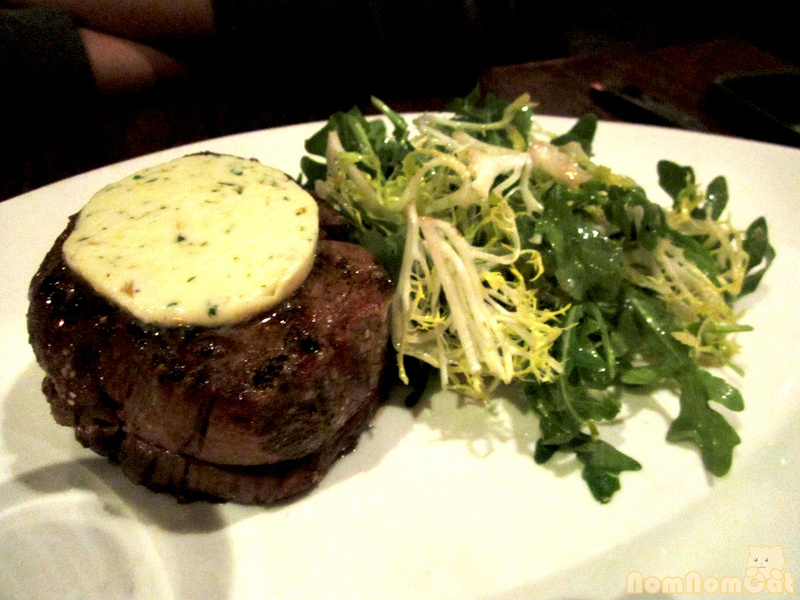 He selected the 8 ounce filet mignon of natural angus beef, simply as it is – topped with a generous dollop of maitre d’hotel butter (a homemade herbed butter) and served alongside greens. The steak was wonderfully tender and cooked perfectly rare as requested; the butter melting over the seared crust added an appreciated touch of fat. The frisee and arugula salad was a bit heavily salted and the vinaigrette was more acidic than we’d prefer, but seeing as how Martin is not a fan of salad anyway, no harm, no foul. Since it was Christmas after all, I gravitated toward the Christmas Specials, a small insert that our server placed on top of the regular dinner menu. My family often celebrated Christmas with prime rib, so I decided to go with that for old times’ sake. It being a whole rib roast, I knew it would be difficult to get a cut that was just right, but I asked for the kitchen to provide the rarest they could. I was very pleased with the generous slab of medium rare (to rare) that was placed in front of me. 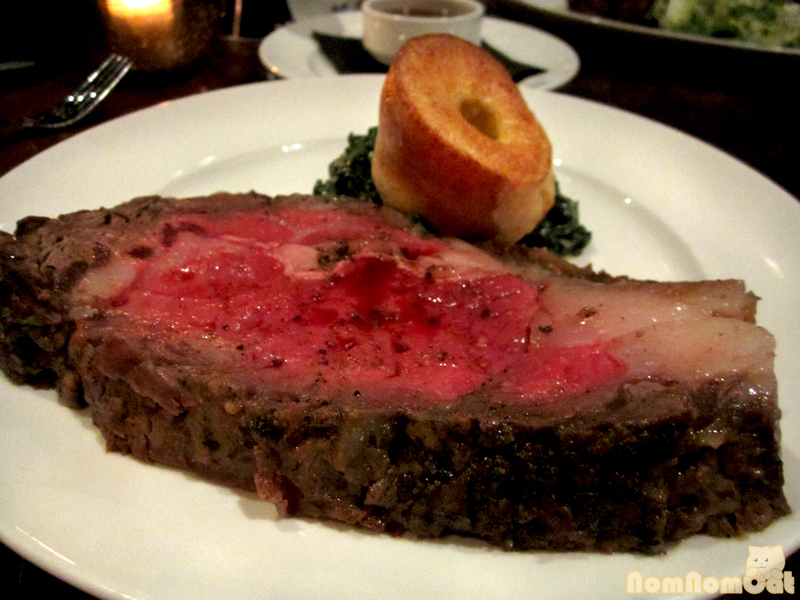 With its peppery crust and a dousing of au jus, the prime rib was incredibly satisfying. The creamy truffled spinach was a pleasant side dish to add a bit of greens in my life, and the yorkshire pudding soaked up the jus the way it should. However, with the portion being unexpectedly humongous, I am ashamed to admit that this entree bested me and I could not finish it. But, as they say, there is always room for dessert. The selection of homemade ice cream and sorbet caught my eye, in particular the pear balsamic sorbet. We asked if we could substitute this for the milk chocolate sorbet that usually tops the creme brulee and it was easily accommodated. The giant crepe dentelle made for an impressive presentation and the creme brulee was the perfect texture — crunchy caramelized sugar giving way to a dense custard filled with vanilla bean. I was very happy with the sorbet, which balanced the sweetness of the pears with the tartness of the balsamic to yield a frozen treat that danced on my palate. I think Martin was most pleased with the feuilletine crumble; we love crepes dentelles and especially appreciate their buttery fragility after having made (or tried to make…) a batch at home. This crumble was tossed in chocolate and were reminiscent of Nestle’s Buncha Crunch candy, one of our favorite movie theater splurges. All in all, we had a great dinner and were very grateful for all of the people who were working on Christmas Day so we could have somewhere to go. 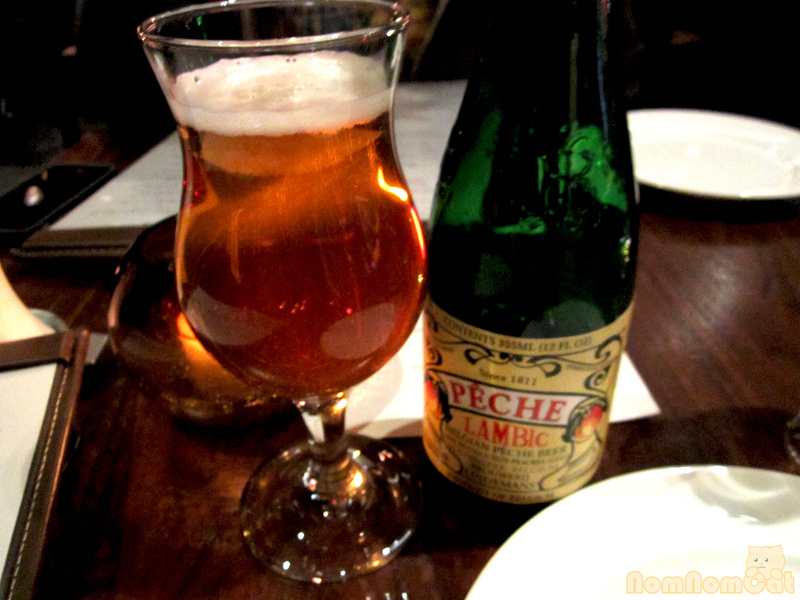 If you find yourself wandering the Strip and end up in the Grande Canal Shoppes at The Venetian, I definitely recommend seeking out Public House for a pint of beer and tasty gastropub bites. And if you were hesitant about vacationing here during the winter holidays, check out this festive scene just outside the hotel. It certainly felt more Christmas-y there than the 80-degree day they were having in our beloved City of Angels!